One of the cool things about being a San Diegan is that you don’t have to own a boat or even a surf board to get out on the water and have a real outdoor adventure. For a family fun getaway, I schedule some play time on San Diego Bay. 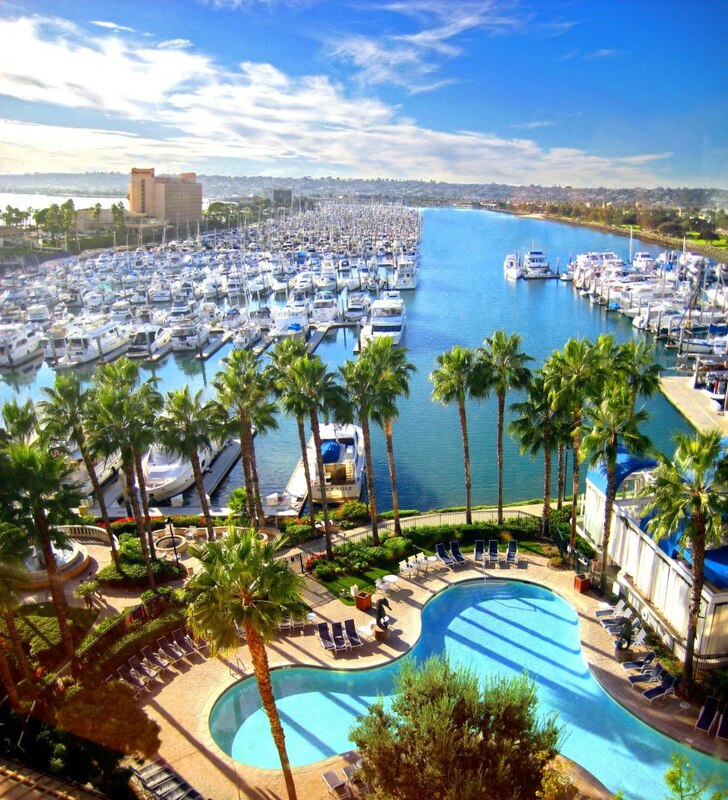 The Sheraton San Diego Hotel & Marina is my home base. From Memorial Day to Labor Day, guests and locals can enjoy the hotel’s Summer Play offerings with free poolside activities for families, daily deals and discounts on boat charters, whale watching excursions, paddleboat or kayak rentals, and more. After a day out on the bay, you can cruise back into the marina and enjoy some pampering at the spa or full service salon at the Sheraton; this includes complimentary parking and use of the pool facilities, of which there are three! After a dip in the quieter Lanai pool area, I followed with an aromatherapy massage at the Sheraton’s Island Breeze Spa. The intimate facility offers workout room, men’s and women’s locker rooms and a variety of treatment rooms offering massage therapy, body wraps and cleansing treatments. Island Breeze Spa has expanded their spa services by offering single or couple massages at an outdoor pop-up cabana that overlooks the San Diego bay. On my next visit, my daughter and I enjoyed the 10:00 AM Saturday outdoor yoga class courtesy of YogaOne ($17 adult, $12 child). 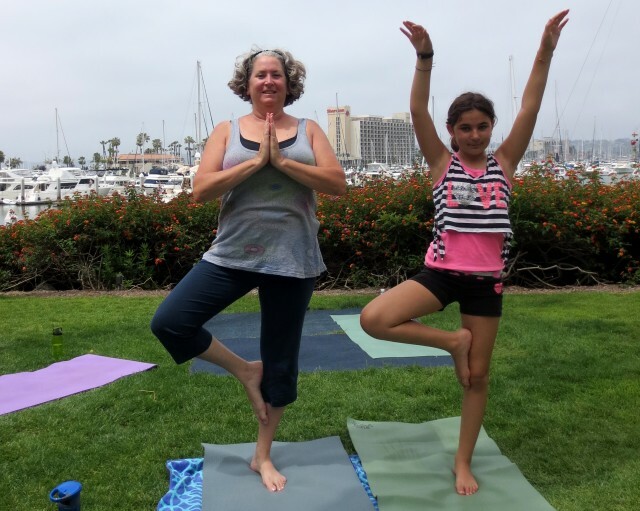 Nothing starts off your weekend like doing a tree pose on a lawn surrounded by palm trees while gazing upon sailboats as they glide along the harbor. After yoga, we headed to the Marina Tower pool and my daughter enjoyed some of the kids’ activities planned by the staff. The Shoreline Restaurant, next to the pool, provides full service dining with delivery right to your lounge chair. Rose played pool games and ping-pong then dug into a burger and mango smoothie while I relaxed poolside with my mojito. We’ve yet to try the family friendly Dive-in-Movie every Friday and Saturday night in the pool; so we might just have to book a room to fit it all in. Where’s your favorite place to cool off and relax during a warm San Diego summer day? 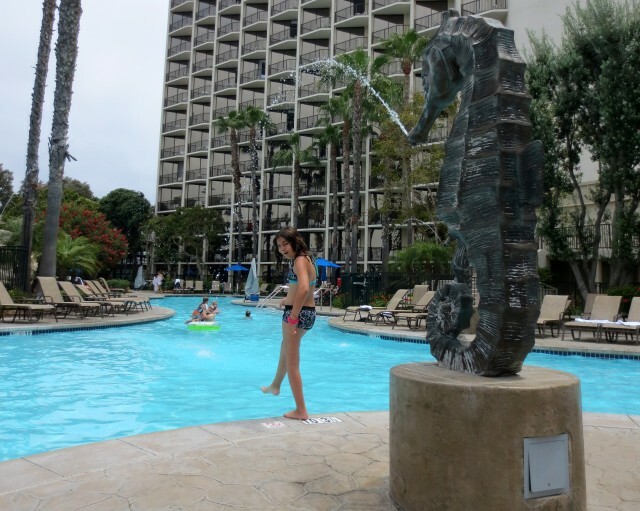 This entry was posted in Family Vacations, Hotels & Places to Stay and tagged family friendly, harbor island, outdoor yoga, pool, San Diego, spa, summer by Sarah Weinberg. Bookmark the permalink.